Teamwork makes the dream work! 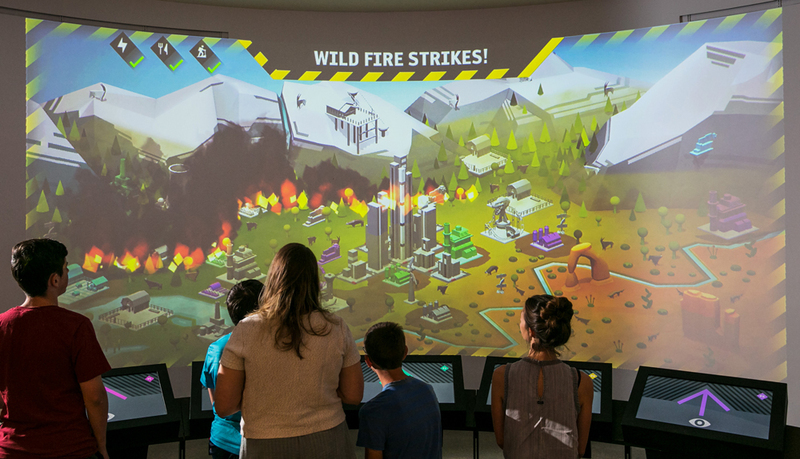 Players collaborate to tackle climate change in an immersive, multiplayer space for families. At a critical time in our planet’s history, amidst a challenging political climate, this awesome American organisation stuck their neck out and commissioned a simple, social and powerful game to change visitor attitudes and citizen behaviour. Gameplay is round-based and each round allows active players to make choices about what to add to or remove from the dynamic world and then see the result of their collective choices. Players of all ages can dip in for a few minutes or stick around for hours, trialling different strategies to affect the beautiful shared world. Ultimately players must work together to effectively balance biodiversity, energy, food, recreation and a growing city. The process started with a Creative Sprint on site in Salt Lake City, Utah, bringing key stakeholders together to explore inspiration, rapidly prototype and test with users. In a multiplayer game like this, the clearest metric of success (beyond dwell time and repeat plays) is simply the volume and level of discussion between players, many of whom have never met before. The gallery is a hive of activity, stimulating conversation between committed players and casual observers alike. A facilitator, writer and Creative Director bringing playful innovation to arts and culture.